The Combine Forum > Farming Community > Fabrication and DIY Repair > Best/worst paint. I got inspiration from the post about using a surface mount effluent pump for diesel fuel. 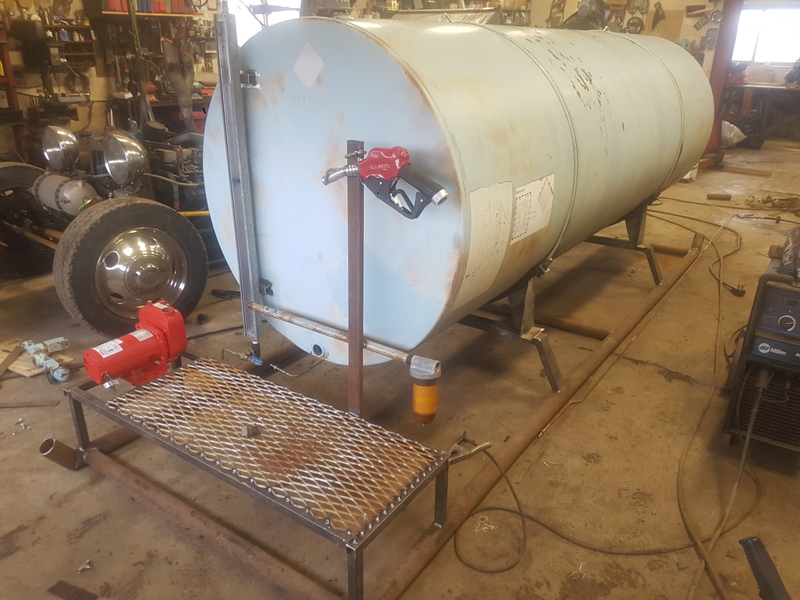 I had a clean 1000 gal tank laying around with plans to build a fuel skid. So I'm doing it! When its all said and done, to keep the wife happy and the yard looking spiffy... it will get painted white. So the skid is just made of some drill stem, the tank has a small amount of surface rust... I'm NOT about to sandblast the thing, but will perhaps give it a good blast with the hotsey before painting. Does anyone have good/bad experiences with different brands of paint? I used KBS Rust Seal this winter on a grain trailer frame. Too soon to see how long it lasts except I got a bunch on my hands and it was impossible to get off.....and I tried everything! Took the better part of 2 weeks to wear off. You can get POR15 also.....very similar product. They are industrial paint and and you brush it on. It spreads out nice and doesn't leave brush marks. You can probably get away with one coat. It's about $50 in a 1 litre but that goes a long way......way more than Tremclad. Also you can get a liquid rust etcher to spray on with a squirt bottle first....eats off the orange rust and neutralizes it so the paint sticks better. I used KBS Rust Seal this winter on a grain trailer frame. Too soon to see how long it lasts except I got a bunch on my hands and it was impossible to get off.....and I tried everything! Took the better part of 2 weeks to wear off. You can get POR15 also.....very similar product. They are industrial paint and and you brush it on. It spreads out nice and doesn't leave brush marks. You can probably get away with one coat. I have a spray gun.., can that be sprayed on as well?? They say you can spray but it would have to be thinned down quite a bit. Brushing works pretty good. If you Google it you will see it's meant for things like car frames. Did you try soaking them in cider? No...hadnt heard of that one! However I really doubt it would have worked. In the end it was the oils from my skin that lifted it off....that stuff got into every pore and crack it could find and bonded to my skin!! So much for reading the instructions after I painted! !